If you arrive in Malaysia during the Mid Autumn Festival you will be surrounded by mooncakes. If you have never seen a mooncake before, chances are, by the time you have left Malaysia, you will have not only seen them but tried one too. So, what is a mooncake? A mooncake is considered a sweet delicacy in Malaysia. Having been developed by the Chinese, their sphere of influence now extends to Malaysia and many other Asian countries. Traditional mooncakes are quite large and as such are rarely eaten all at once by one person. Made from a standard mooncake mould, they measure around 10cm in diameter and are around 4 cm high. Contained within a pastry is a thick centre, often made from typical mooncake ingredients of lotus seed paste or red bean paste and are baked. Often, a salted egg yolk can also be found. They are imprinted with a stamp of Chinese characters depicting, amongst other things, the name of the bakery or chef. I had no idea how these were made so it was great to be able to learn from the Chef at The Emperor Restaurant, Dorsett Grand Subang. You can see how my efforts went in the video below. Because of their size, mooncakes are generally eaten by cutting a wedge from the cake. Mooncakes are made especially for the Mid Autumn Festival, also known as the Lantern Festival in Malaysia. It’s a special time for celebrating, and is held in accordance with the lunar calendar. On the 15th day of the eighth month of the lunar calendar, the Mid Autumn Festival will be held. It coincides with a full moon. Mooncakes can also be made without baking. Crystal skin mooncakes, or snow skin mooncakes as they are also known, use a rice flour casing and are not baked. This form of mooncake originated in Hong Kong as a means of cutting down on the high fat and high sugar content of the more traditional mooncake. The traditional mooncake flavours include lotus seed paste, red bean paste and sesame. Mooncakes are getting trendy though, with modern chefs now coming up with an unusual array of ingredients to spice them up. Today, you’ll find such thing as the flavour of blue pea flowers, pandan, chocolate and custard being enveloped inside the pastry. Sizes are also changing, with miniatures, perfect for popping whole into your mouth also popular. The ingredients are different depending on whether you are making one with baked pastry or the crystal skin version. The ingredients will also differ depending on country, region and the person cooking them. These are some basic ingredients to make blue pea crystal skin mooncakes. 150ml blue pea or pandan liquid. The liquid is made from soaking approximately 10 blue pea flowers in water until the water reaches a deep purple colour. Extra flour for rolling and for the mooncake mould. Lotus seed paste can be purchased already made. If you would like to make your own there is a great recipe here. A chef would do the salted egg yolks themselves, but once again, for ease, try buying these from the market. Pour rice flour into a large flat metal receptacle. Make a well in the centre and add icing sugar. Add shortening and rub until combined. Add blue pea liquid. Can be substituted for pandan. Using one hand, mix the liquid in with the dry ingredients until combined. It’s important to be very delicate when doing this and don’t overwork the mixture. Get a ball of lotus seed paste and push a hole in the centre. Add a salted egg into the hole and working very quickly (and with both hands) cover the egg yolk with the lotus seed paste. Roll out the mooncake pastry into a log and then cut into equal pieces. Press down between two pieces of plastic to prevent it from sticking and roll out to a size that will be large enough to cover the filling. Place the lotus seed paste ball into the centre of the pastry and working quickly once again, rotate the lotus paste in one direction and the pastry in the other, until the pastry covers it all. Lightly flour the mooncake mould and the mooncake ball and then push it into the mould. Tap the mould gently on a hard surface until the mooncake comes out. 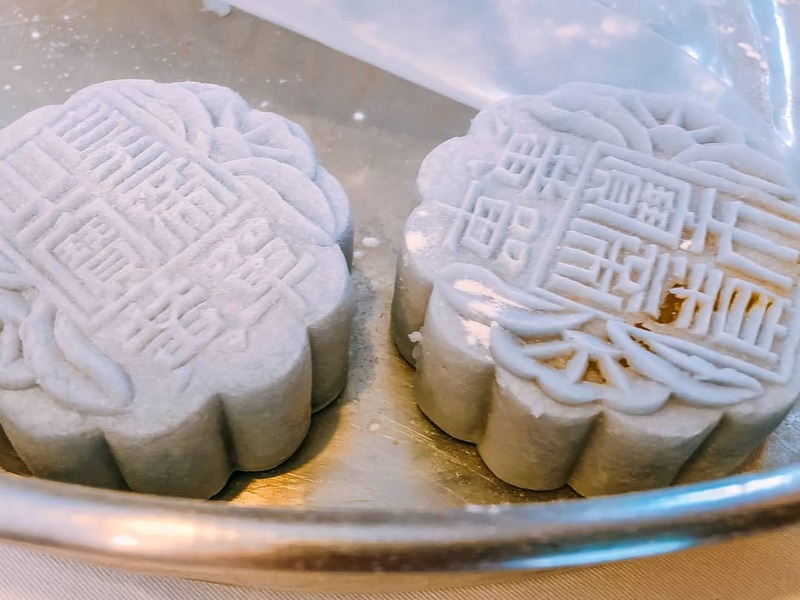 A recipe for making crystal skin mooncakes, an un-baked version of the traditional mooncake, popular in Malaysia during the Lantern or Mid-Autumn Festival. 150ml blue pea liquid. The liquid is made from soaking approximately 10 blue pea flowers in water until the water reaches a deep purple colour. Pandan liquid can also be substituted. Using one hand, mix the liquid in with the dry ingredients until combined. It's important to be very delicate when doing this and don't overwork the mixture.